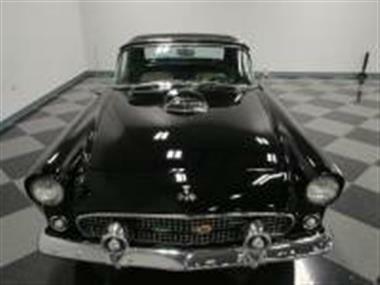 1955 Ford Thunderbird in La Vergne, TN for sale. These first-year T-Birds are always in demandand#44; but if youre a true connoisseurand#44; youll want to make sure your example that launched the legend is a true cut-above classic. 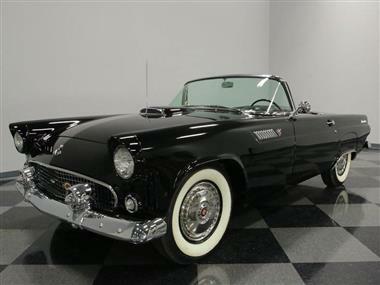 Thats what this 1955 Ford Thunderbird offers. 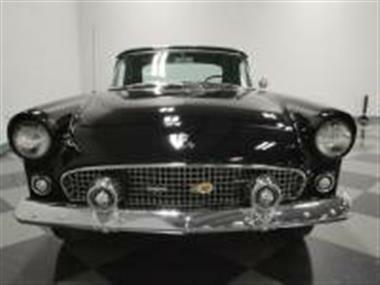 Immaculately restored in its correct Raven Blackand#44; this numbers-matching big block car impresses with every little detail.<br /> <br><br> Theres nothing more beautiful than Fords personal convertible in black and chrome. Code A Raven Black lacquer paint covers every square inch of the body to great effect. 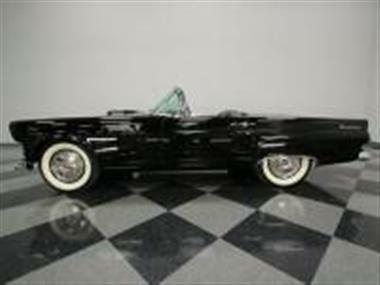 Its part of a painstaking restoration that brought this car back to the February day it left the Dearborn factory. Were not the only ones to recognize this convertible for its excellence. Its a multiple award-winnerand#44; including the Silver Award from the Classic Thunderbird Club International (CTCI). Fit and finish are extremely goodand#44; with doors that close with confidence. Its the kind of panel fit that when the black folding roof is stashed behind the seatand#44; the car has that cleanand#44; unbroken line front to rear thats made these an icon. Its truly a grand touring sporty appearance with the hood scoop in front and the optional fender skirts in the rear. All the chrome and bright trim is in placeand#44; which looks fantastic against the black. This is especially true for the mirror-like wraparound chrome front bumperand#44; and in the rear the twin tailpipes poking through the rear bumper guards was truly a designers touch. Correct bright factory hubcaps set with reproduction Firestone whitewalls complete this 1950s time machine.<br /> <br><br> If you liked the outside appearanceand#44; youll love the interior. The exterior black is joined by white for a striking two-tone combination that will have people complementing you about how clean the interior looks. While it came from the factory this wayand#44; many will swear its a custom creation. 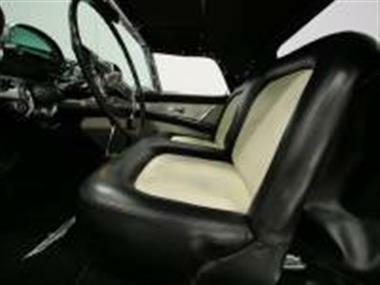 Style and luxury were the true hallmarks of this classicand#44; and thats why it came with rare features for its time like the power seat and power windows. The heat/defrost sliders and upgraded AM/FM radio are all displayed in a machine-turned panel that flows across both doorsand#44; and the dash. This frames the power steering wheeland#44; and above it is the nifty speedometer thats lit from behind by a Plexiglas panel viewed through the windshield. Just to the left is the large tachometerand#44; so while this is a luxury cruiserand#44; you do get a few reminders of the large V8 under the hood.<br /> <br><br> This car carries its original block with the same clean and authentic style as the rest of the car. 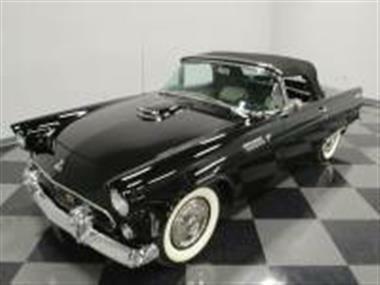 The Thunderbird Special 292 cubic-inch V8 looks authentic right down to iconic Thunderbird logo valve covers and hood-fed chrome teapot air filter. But take a closer lookand#44; because youll start to see that the entire engine bay has been given its correct factory stampingsand#44; which is what really impresses the judges and T-Bird fans alike. 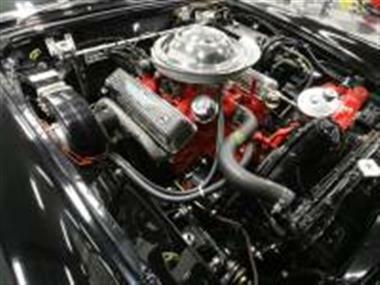 As the correct motor for the carand#44; it is the higher compression 8.5:1 that came with the automatic transmission and the correct Holley four-barrel carburetor. Its a powerhouse of a V8and#44; but it doesnt lose its luxury-minded attitude as it sweetly purrs through its dual exhaust system. The aforementioned Ford-O-Matic three-speed automatic transmission stays comfortable as it clicks through the gears without a fuss. You can see from the undercarriage shots that the restoration extends to the places most people dont seeand#44; so the ride is truly as luxurious as Ford intended for their personal convertible.<br /> <br><br> Complete with the original owners manual and other documentationand#44; this is a true enthusiasts classic. People love a 55 because its the car that launched an iconand#44; but for those who are about representing the best Ford had to offerand#44; only a car this correct will do. Call today!! !